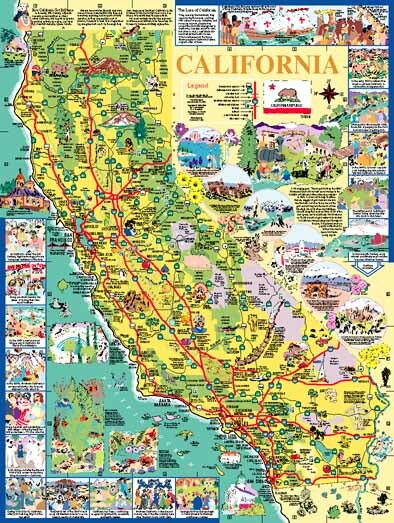 Home to approximately ten percent of the nation's population, California is the most populous state in the U.S. In land area, it ranks third: only Alaska and Texas are larger. This map shows the state's highways, cities, national parks, national monuments, national forests, agricultural products, and visitor attractions. Enlarged detail showing the area around Santa Barbara. Enlarged detail showing the area around San Diego. Enlarged detail from border that surrounds the map. Enlarged detail of map of downtown Sacramento.